It’s obviously a ludicrous idea but how is it different to GPs trying to deal with a daily stream of people with chronic disease? With (usually) the most cursory knowledge of nutrition and ways to change life style, aren’t they doing something very similar? Everyone agrees we have an increasingly unhealthy population with rates of obesity, diabetes, cancer and Alzheimer’s soaring. And many estimates put the proportion of cases that could be avoided by eating well and following a healthier lifestyle at around 50%. Yet 40,000 skilled and expensively trained GPs sit on the front line to deal with patients needing help with nutrition and lifestyle with no real knowledge of how best to do it. The only difference between them and the theoretical nutritionists in an operating theatre is that their patients die over years rather than hours. Why this mismatch between medical skills and what patients need has to change was the focus of a conference held last week. ‘Food: the Forgotten Medicine’ was organised by the College of Medicine and held at the Royal Society of Medicine in London. [See Programme – PDF] The speakers were nearly all doctors or clinicians who had already incorporated nutrition into their practice. They talked with passion and authority on how this approach can offer GP’s a far more sophisticated set of options to deal with the myriad problems that come with chronic disease. By the end it was all too clear that the existing tool box GP’s and other medics currently rely on to deal with chronic metabolic diseases – Eat a healthy balanced diet and try to get a bit of exercise – is desperately in need of a massive upgrade. The grand old man of nutritional medicine, the American doctor Andrew Weil took us on a whistle-stop tour of some of the possibilities. “A patient is more than just a physical body,’ he began, immediately introducing a much broader perspective than the one usually available in a time-poor GPs surgery, emphasising the importance of such lifestyle issues as sleep, ways of handling stress and social connections as factors that can help or hinder health. All of which can directly impact on such an obviously physiological problem as raised inflammation, often found in people with chronic disease. The aim of the non-drug approach is to return the system to a healthy balance between enough inflammation for repair and protection but not enough to cause damage. One of the attractions of sophisticated nutrition is the number of options – nearly all low risk when used carefully – that may work for different conditions. So another route to bringing down inflammation is to reduce intake of polyunsaturated vegetable oils, used for cooking and found in processed foods. This is now controversial since vegetable oils have long been sold as the healthy option, in contrast to those dangerous saturated fats, but the evidence increasingly suggests that the two should swap approval ratings. 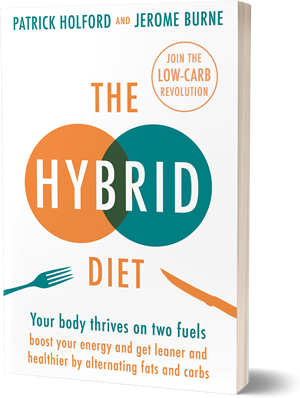 Here again a good grip on nutrition is needed to help patients to understand the evidence and to make this switch not just with fats but also to make sense of the confusion currently swirling around the debate over the benefits of a low carbohydrate diet. Not only are there more safe options with nutrition but when used together they tend to co-operate rather than compete. For instance, there is a third way to bring down inflammation, in addition to fasting and compounds such as curcumin, which is with exercise. But why those three? At first sight they seem rather arbitrary. This is a good example of the way that the lifestyle approach can use multiple approaches that benefit the whole body. It’s been known for a long time that both fasting and exercise are, obviously, ways of losing weight but also for living longer and, more recently, that one of the ways they work is by cleaning-up of the garbage and waste products that can build up in the cells of older people. But how does curcumin fit in here? The reason that it, along with exercise and fasting, it provides similar benefits is because they are all able to turn on a set of genes known as sirtuins which have been linked with increased lifespan, garbage clean up and reducing inflammation. Curcumin is just one of a type of plant chemical known as a polyphenol, which can have very specific effects, often by altering gene activity. How can you advise on fats if you don’t know nutrition? Among the many natural substances that can also affect gene activity are the omega 3 fatty acids, more commonly known as fish oils.. ‘But even though the evidence for their benefit to the brain and cardiovascular system is very strong and has been growing for years, it continues to be largely ignored,’ says Dr Alex Richardson of Oxford University, one of the leading lipid researchers. Being able to ignore omega 3 benefits is to be expected if you know very little about fats in general, however the recent increasingly heated debate over the high fat low fat issue highlights the way doctors’ ignorance may have been tipping patients out of the frying pan and into the fire for years. And the issue is not just how much fat we should be getting but what sorts. Polyunsaturated vegetable oils have long been recommended as the healthy alternative to saturated fats, but experts like Weil and Richards claim they should be used sparingly not least because of their effect on inflammation. Yet omega 3 is also polyunsaturated but it’s anti-inflammatory. It’s complicated. And that’s just the start, Richardson points out. If you want to properly advise patients over saturated fats you really need know there are at least 30 different types with quite different properties before you start. So nutrition and lifestyle is not a soft option and it is about to get a lot more complicated as Professor Tim Spector of King’s College London made clear when he took us on a witty and lightening tour of our microbiome – poo to you. It’s emerging as a leading player in our health also regulating weight gain or loss, how well we handle fats, our levels of inflammation, and probably our moods and mental states also. ‘The influence of this two pound colony of bacteria living in our guts is one of the reasons why it is hard to get consistent and clear results from trials involving diet,’ says Spector. ‘We all share around 99% of our genes with other people but our microbiome is far more individual. Spector reported on a trial of one – his own son – which showed why some people become ill after a relentless diet of meals from food outlets like McDonalds. ‘After just 10 days of eating nothing else, the number of species recorded in his poo was down by 1200. After what was only a brief glimpse of the specific and varied ways you can directly affect the working of your whole system with nutrition and lifestyle you couldn’t help wondering – why on earth wouldn’t doctors want to know this stuff? Not only does it allow the patient to become more in control of their health but it provides the doctor with so many more levers to pull. ‘I talk to them and I listen. I get to understand what works for them and what they need,’ she told us. ‘Often it’s something very simple like how to read a food label. I’ll get to find out about their home life. It all sounds like the best sort or neighbourliness but does it actually achieve anything? This is what Dr Marie Polley, lecturer in health sciences at the University of Westminster, wanted to know too. So she tracked 124 diabetic and pre-diabetic patients who had been given Ruth’s social prescription but no other sort of treatment. The results for nothing but chat and kindness were remarkable. The key blood measurement for diabetics is the HbA1c which tells you how high your blood sugar has been on average over the past three months Over 48 and you are diabetic, 47 to 42 is pre-diabetic and below 42 is normal. Of course there are huge issues with the cost of running nutrition trials and the best ways of gathering evidence for multiple lifestyle interventions but pretending none of it is effective and can be ignored really isn’t an option. Nutrition is indeed the neglected elephant in the health room. But they need to sort out what to teach doctors and it’s certainly not the current advice. I’ve never heard anything from a doctor, except vague and meaningless advice to eat a balanced diet. That seemingly means 50% carbohydrates. So, effectively eating 50% glucose makes sense to Public health England and they still can’t work out what driving obesity and diabetes! I think historians in the future will look back at this public health disaster as being as sensible as witch burning and blood letting. The biggest difficulty,according to experts,is that diabetes remains symptomless for years and only by testing individuals -particularly those who are overweight can they begin to assess the risk of diabetes and bring blood glucose levels under control at an early stage . According to Dr Diarmuid Smith ,consultant endocrinologist at Beaumont Hospital anyone in a prediabetes state that is found to have impaired fasting glucose or impaired glucose tolerance -is at a 50 per cent risk of developing type 2 diabetes . Lifestyle intervention ,such as weight loss and physical exercise programmes,are widely known to be the best way to prevent those with pre-diabetes becoming diabetic. Dr Aisling O’Leary ,a lecturer in pharmacy at the RCSI says education of patients and the public of the symptoms and treatment of diabetes is crucial.People need to understand and take their medication correctly and monitor their blood glucose? Have I a question mark?WHY THEY SPEND 1 BILLION for treatment, and about 60 per cent of this spending is on the treatment of the complications of diabetes,Patient self-management and self-care is very important.Nutrition Eat healthy,drink moderately,be physically active manage their stress and not smoke .if people are educated why they continue to harm themselves? Even as the health professions increases ,and specialists multiply ,there is an increasing scepticism of their power our body does grow old .No system can cure disease.No person can cure you of your ailments,aches,pains and diseases.The human ,body is self -repairing and self-healing.You break a bone ,the doctor sets the bone and puts it into the cast .The broken bone knits together again.The internal healing forces that are within every human body. Doctors caused diseases largely resulting from drug toxicity,the fundamental problem is slow accumulation in our tissues of waste acids and other chemicals. This came about because we cannot excrete as fast as they arrive in the chemically food we become accustomed to eating too much often and too large quantity. In our circulation, these waste acids can form a sticky colloidal gel. This severely restricts metabolic work forcing us to replace damaged active cells with inactive fibrous tissues. That is the beginning of the destruction rheumatic can cause,slowly over several decades ,in comfortable people (culpable, culled, cunning) temporary by their drugs vague and fleeting through the symptoms of this process are,doctors were never justified in ignoring it. They have simply refused to take any active part in the one debate that matters,the quality and balanced of your diet. Nutrition takes practically no place in the medical curriculum,and even there consists of entirely dead mono technical information. Reversal of the accumulation process is our best chance of preventing for worse disease doctors understand little and treat poorly. We all know somebody diabetes;but what about prevention? if is type one or two. We have people go to the moon and bag surely we can prevent some diseases. I Will question everything?Medicine is on the wrong track;It is merely fussing with the end results of a condition instead of attempting to remove the cause. I am not convinced by facts and figures or the latest research. No matter how diverse our disease,there is one underlying cause,wrong chemical conditions in the body. OUR Immune system if is strong can fight disease. Medicine is the study of disease ,whereas nutrition is the study of health .Your health is in your hands few diseases became a problem when nutrition is a priority. I couldn’t possibly accept medical nemesis. Others can make the suggestion but no one except ourselves can eat the foods of value to us.The health we enjoy or the sickness we must endure, therefore ,is largely of our own making. When one sincerely wants health and is willing to work patiently toward it,the rewards are for coming. Educate yourself Nutrition is the best medicine. Sooner or later our bodies wear out we will face ageing we have to accept Nature no one will get out alive. Our outpatient clinic has nutritionists on staff who see the patients after the MD/NP. We have had tremendous success in providing this existing source of nutrition expertise to patients, and in significantly improving health profiles. Our physicians feel “maxed out” with everything else expected of them and agree that, even if trained, they would have limited time to keep up with the latest advancements in the field. Why not medics don’t take nutrition seriously? I do and I never get sick.If I have an accident or an emergency operation then I need a medical doctor. Professional researchers know and own(as do policy institutions,research foundations and state agencies that fund them}part of people world about which people themselves know very little. By own data about oppressed peoples,the experts own part of them.The very owning data and controlling of the stories of oppression adds further to the oppression as it means that there are now people who can claim to know and understand you better than you understand yourself the experts there to interpret your world and speak on your behalf.They take your voice by speaking about you and for you Lynch 1994. It is the requirement that medics do not colonise the injustices of others,and by doing exacerbate their susceptibility to manipulation and control. Illich 1976 was critical of the whole medical industry bureaucracy and highlighted the perverse role of medicine in creating illness and injury through inappropriate and incompetent interventions.